Round 2 of the 2006 Asian Championship on March 19th was a clean sweep for Thailand with Arnon Theplib (Turbo) winning both Motos of the 125cc Championship while his 14 yo Countryman Arungkrung Pinpon achieved the same in the 85cc Championship. With the addition of Riders from India, Japan, Malaysia, Saipan, Sri Lanka and United Arab Emirates at the Puerto Princessa Round, the 2006 Asian Championship now boasts a total of 15 competing Asian and support Countries. Organization by Series promoter, Extreme Worx ran like clockwork with Competitors arriving at Manila throughout Wednesday 15th and overnight at the Dusit Hotel before the common one and half hour flight the next day to Puerto Princessa. The natural terrain track was in mint condition and voted tops by the visiting Riders. The wells that had been created and the additional water backup reassured those who were aware of the 2005 dust problems. Qualifying results for 85cc – Pinpon 1:29.497, Alexander Wiguna (Indonesia) 1:32.072, Jon Adlewan (Philippines) 1:33.741. Race day Sunday 19th March. Weather hot and dry. 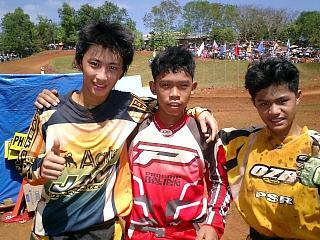 85cc Moto 1, 10 min + 2 laps. Start time 11:15 AM. Number of starters 10. From start to finish it was Pinpon and Wiguna in that order all the way. The capacity crowd thrilled to the style and performance of these 12 to under 15yo kids in the 9-lap race. Dwight Balmonte (Philippines) retired after 2 laps with a misfiring Honda, meanwhile Pinpon and Wiguna picked their way through lappers from the 4th lap onwards. Jon Adlewan (Philippines) slotted himself into third place on the second lap and that is the order they finished with Pinpon recording a winning race time of 13:39.597, Wiguna 13:47.027, Adlewan 14:10.215. 125cc Moto 1, 20 min + 2 laps. Start time 12:00 mid day. Number of starters 21. As the gates dropped, the thundering 4 strokes charged the uphill start straight and it was Turbo and Harvey who went into the first right hander together then down hill again into the high speed left sweeper. The tight pack with them jostled for position then Robinson (New Zealand) went down in the stutters. At the end of lap 1, the order was Turbo, Harvey, Glen Aguilar (Philippines) Aep Dadang (Indonesia) Gabriel DeLaCruz (Philippines) By the 6th lap, the leaders encountered lapped Riders starting with Shi Le (China) who had crashed earlier but was still soldiering on. Although the front two were close, the 26 yo Aussie Electrician just could pass the 17 yo Thai and when the chequered flag appeared after 17 laps, Turbo’s winning time was 23:47.217 to Harvey 23:51.877, Dadang 24:20.742, Aguilar 24:34.863, Otsuka 24:41.948. Once again it was Pinpon and Wiguna, with Pinpon pushing hard and managing his customary crash at a left berm after a high speed down hill on the first lap. Wiguna, Adlewan, Jan Rellosa (Philippines) Mark Lorenzo (Philippines) passed him before the stocky young Thai got himself back on his Honda. The enthusiastic crowd just went wild as he charged through to third on the 3rd lap and second on the 5th lap and when he regained the lead on the 6th lap, the roar of the crowd was that of a football match such was their appreciation for the fighting Thai. Wiguna who rode a controlled race was second on his Kawasaki, while Adlewan with two consistent 3rd places on his Kawasaki moves into 3rd position in the Championship points. Race time had wisely been brought forward 30 min, as there were concerns the track may dry out, however just prior to start, extra tankers arrived and proceeded to water sections of the track much to the vocal chagrin of the five leading Riders. After the sighting lap they commented of slippery sections, however the race started and this time it was Harvey –Honda who led on the first lap however that position was short lived when Turbo on his Honda took over the lead on lap 2. 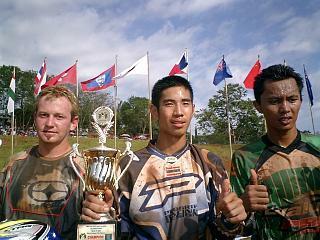 Local hero Glen Aguilar – KTM held 3rd place until lap 6 when Dadang – Suzuki claimed it as his. By lap 11, Turbo had a 10 second lead on Harvey with hard charging Dadang now closing on the Aussie. As they crossed the line for the last time, the winner was Turbo 24:16.605, 2nd Harvey 24:23.607, 3rd Dadang 24:26.336, 4th Aguilar 24:45.664, 5th Robinson – Kawasaki 24:54.777. * Turbo – In Moto 1, I just tried to control the situation. In Moto 2, I was more confident I could win. * Harvey – I was happy with starts and positions in both Motos. I have known Turbo since he was a little kid and he has developed a really smooth style. In the first Moto I was content to hold a comfortable 2nd place but in the second, Aep was getting uncomfortably close. * Pinpon – Moto 1 was OK but I was pushing too hard in the second. * Wiguna – In the 1st Moto, I tried to catch Arunkrung but he was too fast. In the 2nd, although he crashed, I thought he would come through but I did my best.